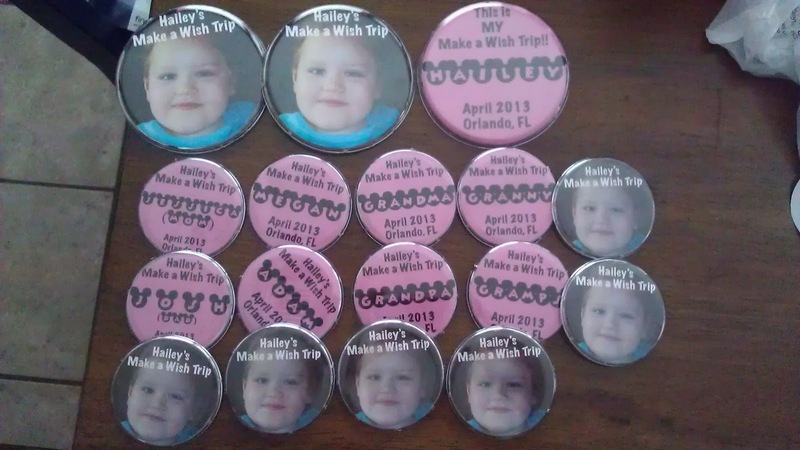 Hugs for Hailey: Make a Wish Trip Part 1 - Getting Ready! 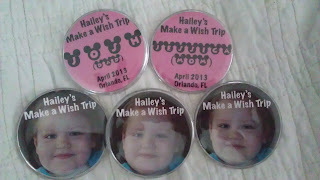 There was so much to do before we left for this trip, and packing was a very daunting task. Not only were we going to the other side of the country for 7 days, but we were going with a disabled child that has special needs and required more then the average child. 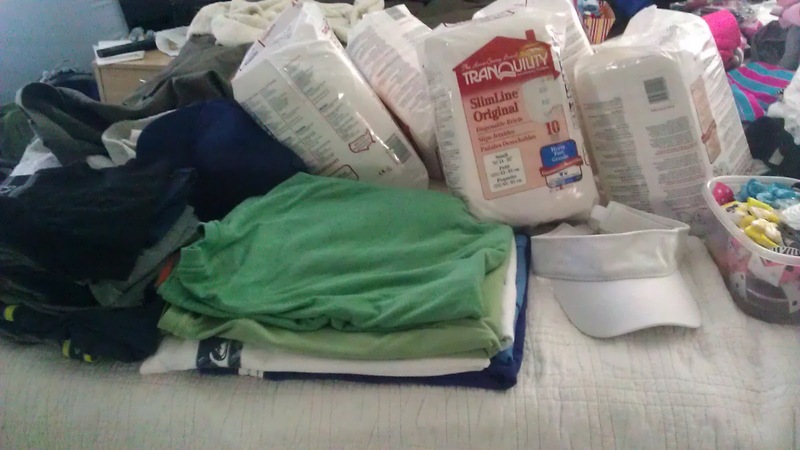 One thing on my list was that I needed to figure out how to get 2 cases of formula packed and to Florida. I knew we needed to take some on the plane during the flight and I didn't know how to go about doing that either. I ended up getting in touch with the TSA. They were VERY friendly. They told me that they would have everything set up so that I wouldn't have to stand in line at the security check point. They would do a pat down on me and Hailey and pat down her chair. She wouldn't have to get out of it. I also got into contact with the head manager of Southwest Airlines and he said he would make sure to get us where we needed with NO STRESS! Music to my ears! I also was able to get that CARES system for Hailey that ended up working great! So besides packing for myself and Josh, Hailey needed 2 suitcases to herself. We had to take packs and packs of diapers, feed bags for formula, 48 cans of formula, syringes, refrigerated medication, regular medication, g-tube pads, g-tube adapters, emergency kit with extra balloon, gravity feed bags incase we don't have power, feeding machine and charger! DON'T forget the charger this time!! 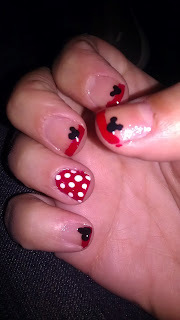 I played around with nail polish and how I should do my nails for such a special event. 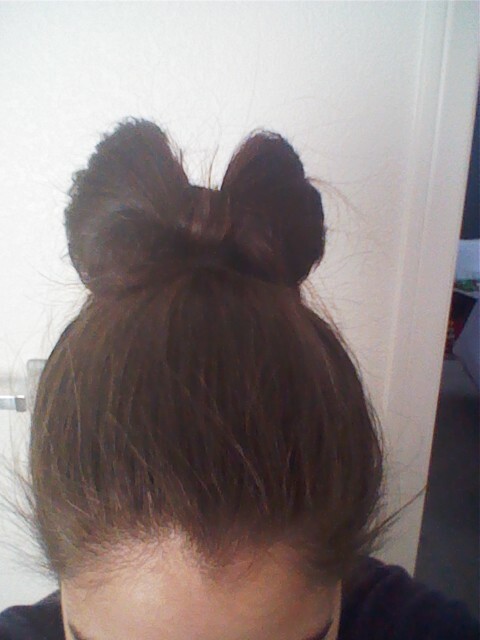 It didn't end up lasting but it was cute for a minute! I love nail polish! 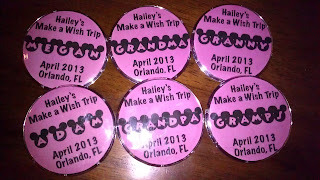 One thing I was really looking forward to was that our family was going to be joining us on this very special trip. We did find out last minute that NONE of MY family members, that we were expecting to go, were going to be going which was very sad for me. I would have no one from my family there for me during this emotional time, and I REALLY needed it. I understand that this was going to be a very expensive trip, and excuses are going to be made, but I know if someone really wanted to go, and really wanted to be there they would have made it happen. BOTTOM LINE. 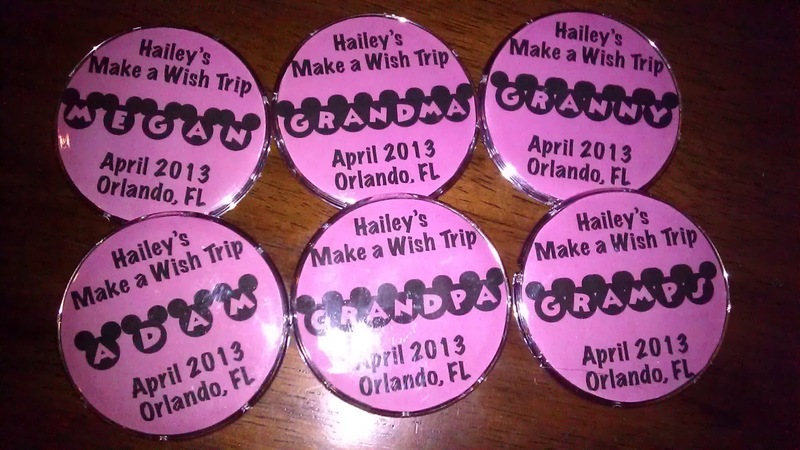 For the family members that were going to be there I thought it would be fun to make these fun buttons for them with their name on them in Mickey Ears. I miss getting to be creative! 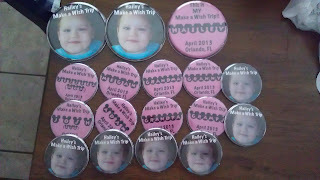 I made EXTRA Big ones for me and Josh to wear and one for Hailey that says, "This is MY Make a Wish Trip!" I also played around with my hair and while I might be a little too old to rock the HairBow Hairstyle it was the Magic Kingdom and you can be a kid again right?? The week leading up to April 8th was going by so fast! I wasn't able to sleep, running over and over in my head everything that we would need. I knew I'd forget something (and I did...BOO). I went on the GKTW website and was able to read a little of what I should be expecting. There is no amount of reading you could do or videos you could watch to prepare you for your stay at the village. It is beyond emotional. Every single day there is amazing. The things they have planned for your child is something one could only dream of. We were packed, we were excited and we were ready for our 4 HOUR FLIGHT! Yikes! How do I keep a 4 year old occupied for 4 hours on a plane?? You'll soon find out!